I've been thinking of going SS but as a 2nd bike. Tho I would like to ask since I'm not that strong of a biker, how fun is it, really? I've tried Agu's Voodoo Zaka and the first thing I felt was it's simplicity on the pedal. Funny as it may sound, that was just around the village! No clutter on the handlebar was the 2nd thing i noticed. I frequent Maarat and going SS on that trail is pretty scary for me. Do you suggest I go for it? If you don't like it, you can always switch back to gears. It grows on you, like every other discipline. go for it! nakakaadik mag ss. 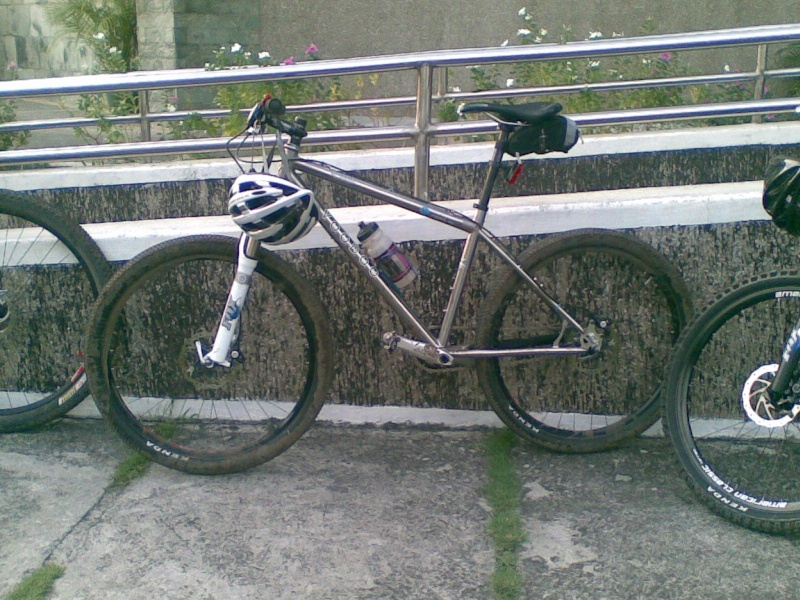 im not a strong rider going uphill kaya 32x21 gear ko. masarap mag ss, i cant explain why pero masaya talaga kahit iwan ka sa patag. masarap din un feeling when you crest a steep hill that you have never crested on a geared bike. go zaka! oops! di yata magandang pakingan ah. hehe! yup, ang gandang frame nyan...mangangarap na lang ako. Humor : are we good? brusko wrote: It grows on you, like every other discipline. nampootaw! ayaw ko tubuan ng bike ang katawan ko oy! di naman kailangan super-duper hi-end ang SS..
as Hans Rey said to us, "As long as you love riding your bike"
@vwbeetle -Tama yan. Banat lang. It's not the bike! ayus! ang dami ko ng resbak! Sometimes it takes time to acquire the taste for SS. You may not enjoy it fully the first ride or even after several rides. As you get stronger it's guaranteed you'll love SS. It's also possible you'll be hooked after the first ride like many of us were. If you make the commitment to SS you will be rewarded by climbing sections you thought were impossible. I tried SSing over 8 years ago. I actually rarely ride my SS now. But whenever I do, I feel like I hadn't stopped. I don't know if anyone has had the same experience, but riding a SS specific bike exclusively might "limit" you in terms of power. In my opinion, I think riding a road bike or your geared mtb might be more beneficial in improving your overall power, just because you could use bigger gears. Whenever I do use my SS (32x16), hills that used to be impossible to climb are doable now. That's my experience, and I also think that parts such as bars (flat vs. riser vs. mary), forks (suspension vs. rigid) has no bearing at all to better riding than say just plain riding. Just ride and the power will improve. Don't be exclusive, spinning an easier gear once in a while is more beneficial than you think same goes with hammering on your big rings--road or mtb. They go hand in hand, SS riding will improve spinning and riding a geared bike will improve your SS power. Just ride and mix it up and the possibilities are "limit"less. Ako rin walang "k" nung nag single speed ako... Pero masarap pala! go figure! As long as you ride! Humor : sarcastic; dry; slow ako e.